I have been fortunate enough to be given several Eduard "Steel" seatbelts sets for review. I am especially happy because for once the review items happen to fit right into my building schedule! At the moment my current shelf of doom that I cycle through includes a Fw190 that is at just the right place for me to use these belts. I will actually be able to do an actual build review, rather than in box only. So, for starters, what exactly are these belts that seem to get some sort of distinction from regular or even "pre-painted" belts? 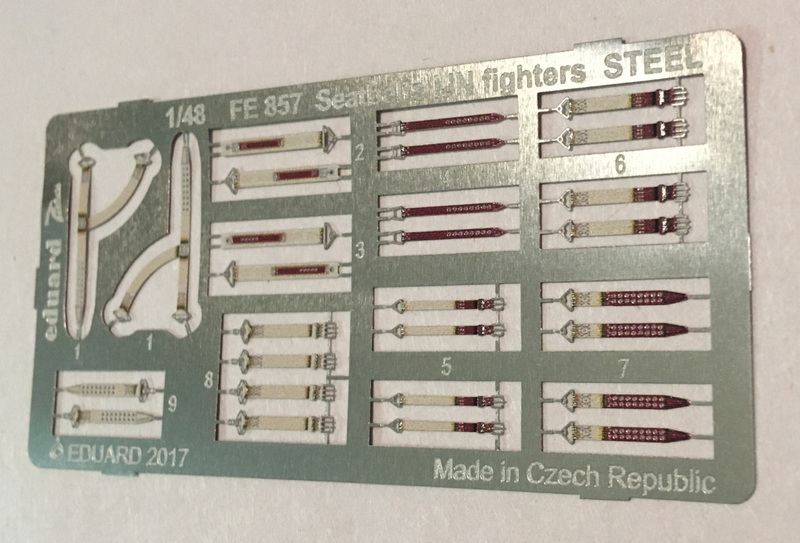 Well, I have used the pre-painted Eduard belts as supplied in the "Flying Machines" produced Fiat G.55 released a few years ago and these "Steel" versions certainly seem better. They appear to have a major difference in that they are in some fashion annealed before being painted. I found that the earlier versions looked great but they could not be annealed for obvious reasons and had some serious trouble with draping in a realistic fashion. In fairness, the orginal belts were quite stiff canvas and/or leather, but this was well beyond what was acceptable. It would seem that Eduard put some effort into using the etching process to thin down the belt material. The thinner material combined with the softer metal results in a belt that can be draped effectively and not look like it was cut from sheet tin! Needless to say, the colouring was very nicely done, with all of the stitching well represented and the buckles left in bare metal. By bending the buckles and gluing the leather pads as per instructions a very realistic belt was achieved with little effort. There was a tab thoughtfully provided to allow attachment to the belt anchors on the armored back rest, designed to work with most kits attachement points. 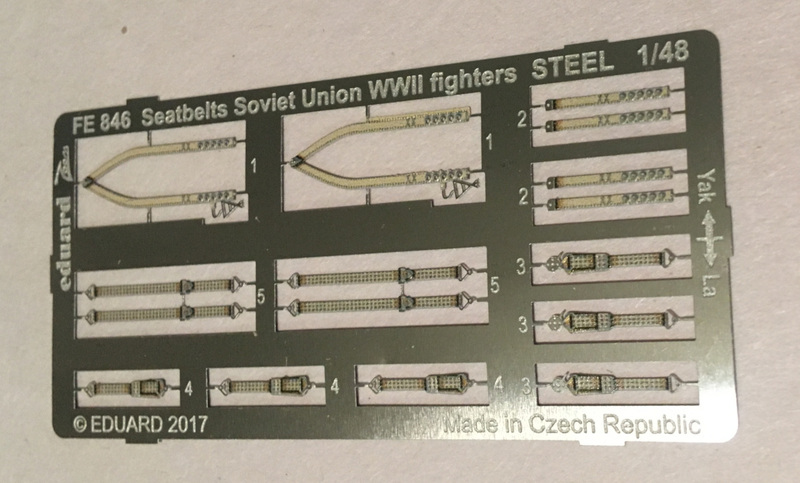 The only significant issue I found with the belts was that in the case of the FW190 set the shoulder belts were far too long. I could not come up with any creative way to drape them that would not look like Rapunzel's locks looking for a window! I cut the belts and took out about a scale foot or so and I used CA glue to rejoin them. Otherwise they would have hung nearly to the floor in front of the seat. The other belts provided for review seem to be in proper proportion, with the possible exception of the IJAAF belts, which looked just a bit wide for the scale using my Mk. I eyeball gauge. 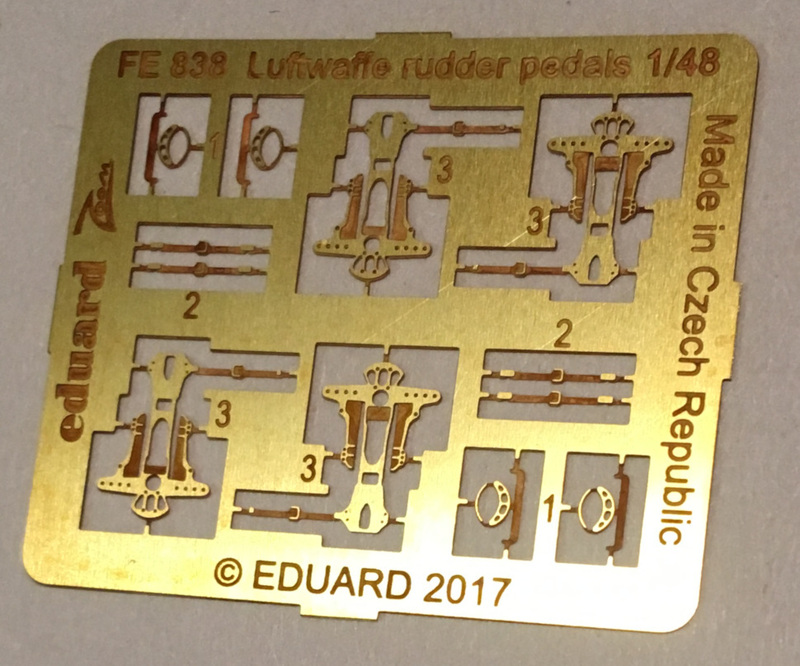 The odd man out set in the batch was the Luftwaffe rudder pedals. They are not coloured in any way, and each one consists of three parts. They are the main foot rest, heel rest and a strap. They are certainly the most detailed I have seen and what sets them apart is that the structure that attached to the rudder bar beneath is also replicated. Probably not very important on something like a 109 or 190 where little can be seen in the footwells, but on an He111 or a Fw189 these could be gold. These are very detailed to the point of overkill for some applications, but since when did that stop us true modellers?! 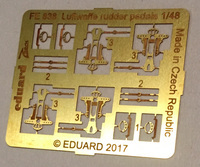 As usual, an excellent selection of enhancements for our models from Eduard. Highly reccomended. 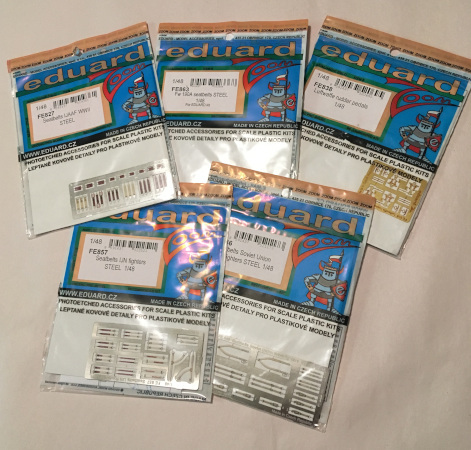 I would like to thank Eduard for the review samples.